Josh acknowledges that people do actually use this staircase in both directions. 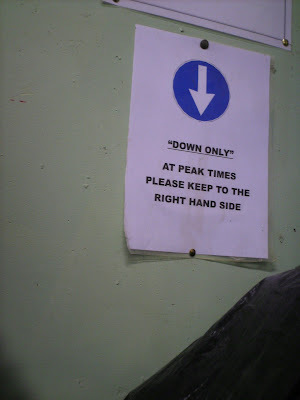 If they really meant to only go down, the direction to stay right would make less sense, in fact. Which leads to my next question: why post the sign at all? lol...very true! When I was in junior high, we had one staircase that was up only and one that was down only. That was the only place I'd ever seen that before.